Once again I am dating myself here. For those of you who remember The Carol Burnett show, she would tug at her left earlobe at the end of each episode (In case you are interested, I have read that this was a way of communicating a hello to her Grandma). -There are a number of lymph vessels under the ear and tugging of it can help to stimulate lymph circulation secondary to movement and stretching of the skin. -A mechanism for ear infections is the blocking of the esutachian tubes. Pulling of the ear lobes facilitates the opening of them. While there are other mechanisms for unblocking the esutachian tubes, none of the others can be as easily performed on young children as pulling of the ears and it is this population who are most susceptible to ear infections. They are the primary reason for pediatrician visits, they can be associated with extremely high fevers resulting in visits to the ER, and multiple infections can result in the need for surgery. It is interesting to note that the motion incorporated in the pulling of the ear lobe is similar to the action performed during breast feeding and it has been well documented in the literature that breastfeeding reduces the incidence of ear infections. 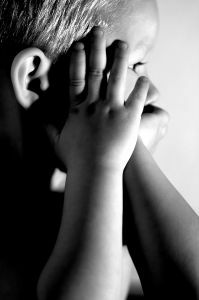 In order to perform this on your little ones, gently pinch your child’s earlobe with your thumb and index finger, tug gently up and down. You can even teach your older children to do this by themselves, particularly after bathing or swimming.